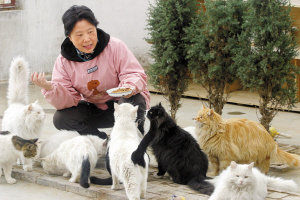 China’s first ‘Animal Protection Law’ is in the developmental stage, whereby many members of Chinese ‘Animal Welfare’ community are being asked for their thoughts and opinions on the matter of animal welfare. Following this valuable input, legal experts have decided to change the references in the draft proposal so as to make a clear and specific reference to a general ‘Anti-Animal Cruelty Law’. In April, these suggested changes were forwarded to the relevant government department. Today, the Animal Protection Law Project Group leader Professor Chang Jiwen – (who is an expert in draft law) from the Social Science Institute – indicated that the ‘Animal Protection Law (Expert Consultation Paper) has progressed positively over a four month period, which saw him receive over 300 emails and more than 400 telephone calls. The majority of opinions expressed have been supportive and objective of the intended law, but Professor Chang also said that some citizens stated that they were unable to accept the notion of ‘Animal Protection’ or ‘Animal Welfare’, because the need to safeguard humanity’s welfare most take precedence. In the light of this input, the Project Group decided to change the emphasis of the formulation of the draft from that of a ‘Protective’ law, to that of a law directly aimed at countering ‘Animal Cruelty’. This ‘anti-cruelty’ concept refers to deliberate and intentional brutal treatment of an animal, which inflicts unnecessary pain and injury, or in the case of lawful animal slaughter, is designed to protect the animal from brutal methods. The Project Group stated that ordinary people felt they could accept the concept of ‘anti-cruelty’ being made law, rather than the vague concept of ‘Animal Protection’. Professor Chang disclosed that the amended ‘Animal Anti-Cruelty Law (Expert Consultation Paper) is divided into nine chapters, and takes its central premise as the prevention of animal cruelty inflicted on wild animals, farming animals, and pets – along with many other specific subgroups and categories. This includes animal medical services, animal transportation, and animal slaughter, and makes clear the law and legal ramifications if the law is broken. It is important to note that this legislation specifically out-laws the eating of cats and dogs. Reporter: the ‘Animal Anti-Cruelty Law (Expert Consultation Paper)’ stipulates that it is illegal to eat dogs and cats, or sell cats and dogs for meat. Those caught doing this will be fined 5000 Yuan and be imprisoned for 15 days. Offenders will also be ordered to sign a legal statement of repentance. Fines for businesses found illegally participating in this activity will be fined anything from 10,000 to 500,000 Yuan. The police and security agencies will be empowered to enforce this law, and the general public is encouraged to report anyone seen participating in this illegal behaviour. The Chinese livestock and agricultural businesses support this anti-cruelty law, as they are of the opinion that in the long term this will assist Chinese import and export industry through the lowering of trade barriers. Pingback: China: Yulin Dog Meat Festival Not ‘Officially’ by Government (10.6.2014) | The Sangha Kommune.